Diving into the heart of the iPad Pro, we have Apple’s latest generation tablet SoC, A9X. Like the other Apple X series SoCs before it, A9X is by and large an enhanced and physically larger version of Apple’s latest phone SoC, taking advantage of the greater space and heat dissipation afforded by a tablet to produce a more powerful SoC. That Apple has developed a new SoC to launch alongside the iPad Pro is in no way surprising, but just as how the iPad Pro has ramifications for the overall iPad lineup as Apple gets into the productivity tablet market, iPad Pro’s genesis is reflected in its component selection. Apple already needed a powerful SoC for the iPad Air 2 in order to keep performance up with the tablet’s high resolution of the screen, and iPad Pro in turn pushes Apple’s performance needs even harder. Not only is there an even higher resolution screen to drive – the 2732x2048 display has about 66% of the pixels of a 4K display – but now Apple needs to deliver suitable performance for content creation and meaningful multitasking. I don’t want to imply that the A9X was somehow specifically designed from scratch for the iPad Pro, as there are a number of more important engineering considerations, but I do want to highlight how the iPad Pro is not just another iPad, and that as Apple expands the capabilities of the iPad they need to expand the performance as well if they wish to extend their reputation for smooth UX performance. Looking at the specifications of the A9X, it seems like Apple always throws us a curveball on the X series SoCs, and for their latest SoC this is no different. With A8X Apple delivered more RAM on a wider memory bus, a larger GPU, and surprisingly, three Typhoon CPU cores. To date it’s still not clear just why Apple went with three CPU cores on A8X – was it for multitasking, or as an alternative means to boost performance – and A9X’s configuration only serves to highlight this enigma. Instead of continuing with a triple-core CPU design for A9X, for their latest X series SoC Apple has dropped back down to just a pair of Twister CPU cores. The catch here – and why two cores is in many ways better than three – is that relative to A8X and A9, Apple has cranked up their CPU clockspeeds. Way, way up. Whereas the iPad Air 2 (A8X) shipped at 1.5GHz and the iPhone 6s (A9) at 1.85GHz, the A9X sees Apple push their clockspeed to 2.26GHz. Not counting the architectural changes, this is 22% higher clocked than the A9 and 51% higher than the A8X. The fact that Apple dropped back down to 2 CPU cores is unexpected given that we don’t expect Apple to ever go backwards in such a fashion, and while we’ll never know the official reason for everything Apple does, in retrospect I’m starting to think that A8X was an anomaly and Apple didn’t really want a tri-core CPU in the first place. A8X came at a time where Apple was bound by TSMC’s 20nm process and couldn’t drive up their clockspeeds without vastly increasing power consumption, so a third core was a far more power effective option. 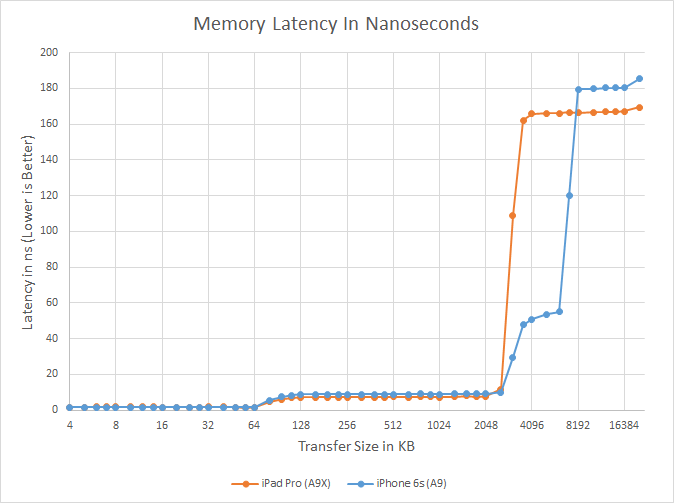 Overall this means that iPad Pro and A9X will set a very high bar for tablet CPU performance. As we’ve already seen in the iPhone 6s review, the Twister CPU core is very potent and in most cases faster than any other ARM CPU core by leaps and bounds. Cranking up the clockspeed a further 22% only serves to open up that gap even further, as Twister is now reaching clockspeeds similar to the likes of Cortex-A57 and A72, but with its much wider execution pipeline and greater IPC. This is also the reason that an Intel Core CPU comparison is so interesting, as Intel’s tablet-class Core processors in many ways are the target to beat on overall CPU performance, and we’ll be touching upon this subject in greater detail a bit later. 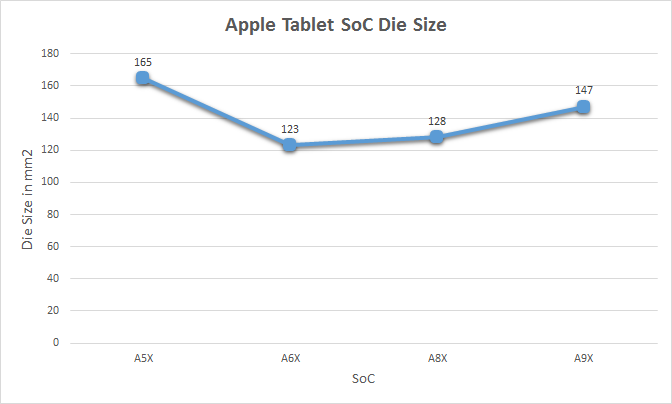 Meanwhile on the GPU side, as expected Apple has further increased the number of clusters on their SoC to drive the higher resolution display of a tablet. Whereas A9 used a 6 cluster design (PVR GT7600), A9X doubles this, giving us a relatively massive 12 cluster design. In Imagination’s PowerVR Series7XT roadmap, the company doesn’t have an official name for a 12 cluster configuration, as this falls between the 8 cluster GT7800 and 16 cluster GT7900. 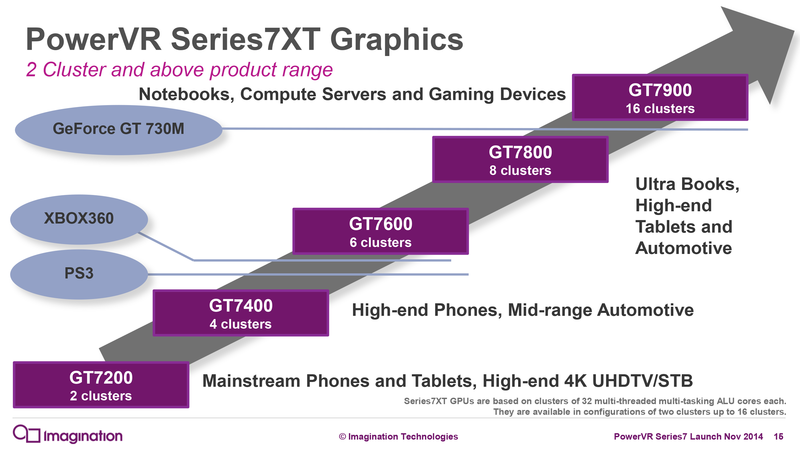 So for the moment I’m simply calling it a “PowerVR 12 cluster Series7XT design,” and with any luck Imagination will use a more fine-grained naming scheme for future generations of PowerVR graphics. 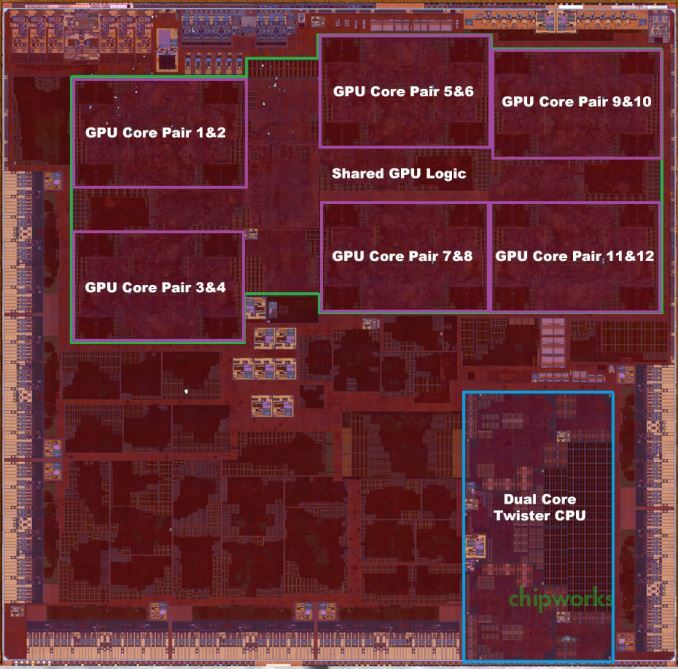 In any case, the use of a 12 cluster design is a bit surprising from an engineering standpoint since it means that Apple was willing to take the die space hit to implement additional GPU clusters, despite the impact this would have on chip yields and costs. If anything, with the larger thermal capacity and battery of the iPad Pro, I had expected Apple to use higher GPU clockspeeds (and eat the power cost) in order to save on chip costs. Instead what we’re seeing is a GPU that essentially offers twice the GPU power of A9’s GPU. However to put all of this in context, keep in mind that iPad Pro’s display is 5.95Mpixels, versus the 2.07Mpixel screen on the iPhone 6s Plus. So although Apple has doubled the number of GPU clusters for A9X – and I suspect clocked it fairly similarly – that increased performance will be very quickly consumed by the iPad Pro’s high resolution screen. Consequently even a 12 cluster GPU design is something of a compromise; if Apple wanted to maintain the same level of GPU performance per pixel as in the iPhone 6s family, they would have needed an even more powerful GPU. Which just goes to show how demanding tablets can be. Responsibility for feeding the beast that is A9X’s GPU falls to A9X’s 128-bit LPDDR4 memory controller configuration. With twice as many GPU clusters, Apple needs twice as much memory bandwidth to maintain the same bandwidth-to-core ratio, so like the past X-series tablet SoCs, A9X implements a 128-bit bus. For Apple this means they now have a sizable 51.2GB/sec of memory bandwidth to play with. For an SoC this is a huge amount of bandwidth, but at the same time it’s quickly going to be consumed by those 12 GPU clusters. It’s also while looking at A9X’s memory subsystem however that we find our second and final curveball for A9X: the L3 cache. Or rather, the lack thereof. For multiple generations now Apple has used an L3 cache on both their phone and tablet SoCs to help feed both the CPU and GPU, as even a fast memory bus can’t keep up with a low latency local cache. Even as recent as A9, Apple included a 4MB victim cache. However for A9X there is no L3 cache; the only caches on the chip are the individual L1 and L2 caches for the CPU and GPU, along with some even smaller amounts for cache for various other functional blocks.. 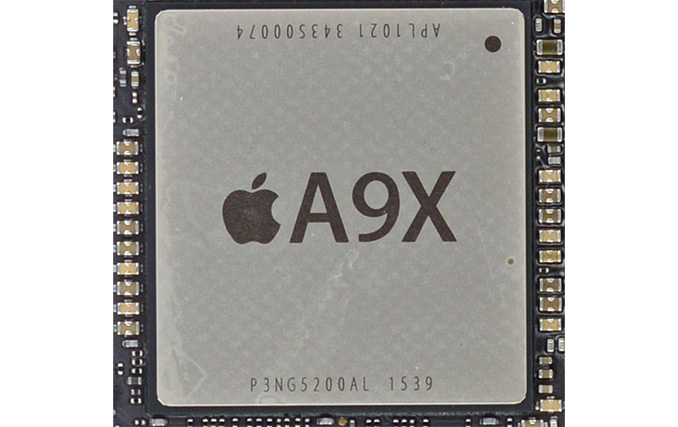 Finally, let’s talk about the construction and fabrication of the A9X SoC itself. Chipworks’ previous analysis shows that the A9X is roughly 147mm2 in die size, and that it’s manufactured by TSMC on their 16nm FinFET process. Some of that comes from the fact that A9 itself is a bit larger than normal – the TSMC version is 104.5mm2 – but Apple has also clearly added a fair bit to the SoC. The wildcard here is what yields look like for Apple, as that would tell us a lot about whether a 147mm2 A9X is just a large part or if Apple has taken a greater amount of risk than usual here. A9X continues to be the largest 16nm FinFET ASIC we know to be in mass production at TSMC (we’ll ignore FPGAs for now), and while this will undoubtedly change a bit later this year once the next-generation discrete GPUs come online, I don’t think you’ll find a better example of how the contract chip manufacturing market has changed in a single generation. 4 years ago it would be GPUs leading the charge, but now it’s phone SoCs and a rather sizable tablet SoC that are first out of the gate. After almost a decade of catching up, SoCs have now reached the bleeding edge for chip fabrication, enabling rapid performance growth, but also inheriting the risks of being the leader. I won’t dwell on this too much, but I’m immensely curious about both what A9X yields are like as the largest FinFET ASIC at TSMC, and just how much of TSMC’s FinFET capacity Apple has been consuming with the production of A9 and A9X. Finally, it's also interesting to note just how large A9X is compared to other high performance processors. Intel's latest-generation Skylake processors measure in at ~99mm2 for the 2 core GT2 configuration (Skylake-Y 2+2), and even the 4 core desktop GT2 configuration (Intel Skylake-K 4+2) is only 122mm2. So A9X is larger than either of these CPU cores, though admittedly as a whole SoC A9X contains a number of functional units either not present on Skylake or on Skylake's Platform Controller Hub (PCH). Still, this is the first time that we've seen an Apple launch a tablet SoC larger than an Intel 4 core desktop CPU.